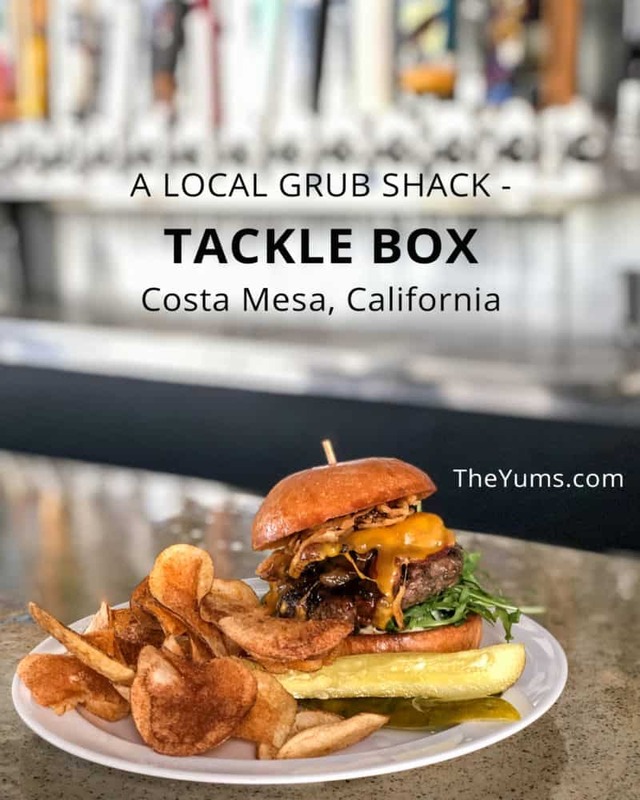 What started as a grub shack on a Southern California beach in 2015, Tackle Box has now grown to two locations. Appealing to the masses with unique flavors and dishes that are quick and simple, Tackle Box is earning a robust community in this locale. Still close to the beach and building on the grub shack reputation, the style of this new restaurant is fast casual with a chef. The owner is proud to say the food is accessible, its everyday food done well. And it’s done really, really well. Based on the name, you might think they only serve fish. However, they also offer beef, seafood, and vegetarian feasts. Owned and operated by Bravo’s Top Chef competitor, Brian Huskey, his common food is done uncommonly well. Influenced by his cooking experience in Asia, France, Peru, and California, his combinations reward your taste buds with tangy, spicy, and unusual flavors. 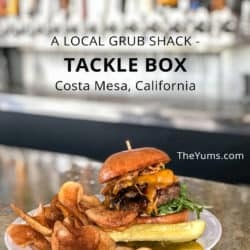 Location: Tackle Box is located at 3321, Suite E, in Costa Mesa, California, in The OC Mix – a local place to eat and shop. Menu: Common names for uncommon food fill the menu. Salads are healthy and sophisticated. The Baby Kale includes smoked almonds, currants, pickled Fresno, and parmesan with a lemon garlic dressing. Just imagine the textures and flavors on your tongue. Chopped Asian Chicken Salad and Iceberg Wedge are also on hand. Grub + Snacks caught my eye. The Buffalo Cauliflower, which was recommended to me by two outside sources, was spicy and delicious. Salmon “Poké,” Brussels Sprouts, Clam Chowder, and Beach Corn that is grilled and served with a Cotija Lime Cream and Parmesan, round out this part of the menu. If you must have a hot dog, there are two options. Chili Cheese and the Street Hot Dog made special with bacon, Pico de Gallo, mustard, ketchup, and aioli, a garlic-flavored mayonnaise from Provence. The “Cali” Cheesesteak is kicked up with crispy onion and Jalapeńo. Other unique additions like Old Bay Aioli to the Poached Shrimp and Remoulade to the Fried Catfish sandwiches make them distinctive. There is a wide range of burgers to select from. Vegetarian with a Greek flair, Blackened Salmon with arugula and citrus slaw, Crab Cake with charred scallion tartar sauce. All other burgers are made from Angus beef. 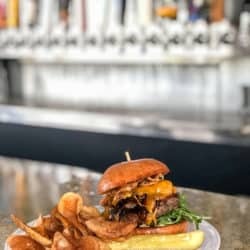 The BBQ Bacon burger was a juicy symphony of Angus beef and smoked bacon, caramelized onion and crispy onion, Huskey’s BBQ sauce, arugula, and aged Cheddar cheese. It wasn’t hidden in an over-sized, soggy bun. Not only the flavor blend but the texture combination was unrivaled. Bar Bites are those snacks that you eat while watching a game on the many big-screen TVs at Tackle Box. You can sink your teeth into the BBQ Baby Back Ribs with Huskey’s BBQ Sauce, or have your Chicken Wings crispy pickled brined, BBQ, or Buffalo style. Plates, on the dinner menu, embrace flavor combinations of Asian pear, seaweed, crispy garlic, and ponzu ceviche sauce in the Seared Albacore “Ceviche”. Shrimp, mussels, calamari, and rice share their bowl in Arroz Con Mariscos. Traditional comfort foods like Quinoa Risotto and Red Wine Braised Short Ribs are enlivened with the Huskey touch. Perusing the menu, I was curious about Pickled Fresno. They gave me a generous sample to try, cautioning me about the heat in this pepper. The first bite was harmless, as was the second. The third, however, was hot because it had some seeds attached. I should have stopped there. The fourth and last bite was over-the-top fiery. It required a milk product to quench the burning. A teaspoon of sour cream did the job. So, if you like blazing hot peppers, this is the one for you. Thoughts: Offering fish to cheesesteak in a sports bar setting is appealing. There is a wide selection of beers on tap, along with wine, mixed drinks, and soft drinks. Whether you are a sports fan or want a simple Saturday or Sunday brunch, Tackle Box is a perfect destination. The name and theme of simple food for the common man go along with Huskey’s belief that fishing is a blue-collar sport that anyone can enjoy. What’s in a tackle box? Simple tools for a game that is suitable for everybody. While fishing is not typically shown on game day, big-screen TVs are easily viewed from all positions in the restaurant. They are terrific for football game day specials. There is an outdoor patio if games aren’t your thing. Whether unusual headgear is de rigueur at Tackle Box or merely a fashion statement, I don’t know. I will admit, however, that a red plaid aviator hat is much more interesting than a hairnet. It seems to fit the blue-collar character of the place. Tackle Box has a sophisticated way of handling customers. If you order food at the bar, it must be paid for there. Otherwise, if you are seated at a table, you can run a tab. Tax is included on all menu items, and substitutions are politely declined. I could hardly take the time to photograph the burger before I sank my teeth into it. My mouth was watering because I knew it had to be good after I sampled the Buffalo Cauliflower. I look forward to trying something else on the menu soon. Price Range: The Bar Bites, served from 3 pm until closing, are $4 – $10. Plates, the dinner menu which is served from 5 pm until closing, ranges from $12 to $24. Available at any time, salads are $9 to $12; Grub + Snacks are $4 to $12; Sandwiches with house made chips are $8.75 to $14; Burgers are $11 to $16. Drinks, other than beer, wine, and mixed drinks, are $3 to $5. The chalkboard lists excellent Happy Hour prices for beer and wine. They have a Wine Wednesday with ½ off all bottles of wine and their special homemade meatball sandwich. Disclosure: My meal and beverage were complimentary on this visit. Julie Diebolt Price is a regular contributor to TheYums.com, is a professional photographer, freelance travel writer, and teacher of photography and business. Along with extensive travel in the United States, she has many European, Mexican, and Chinese stamps in her passport. She enjoys planning, researching, creating and sharing experiences. Julie is a member of PPA and ITWPA and can also be found at www.jdptravels.com.